Students at Hazelton Secondary love playing volleyball…from Intramural Volleyball during lunch, to the Staff vs Senior Girls volleyball game on Thursday, till the zones in either Terrace or our own school, our students play their hearts out and consequently achieve great success. The driving force behind the volleyball program at Hazelton Secondary is Monsieur Melanson. This year together with Mrs. Giguere, Mrs. VanTunen, student and star-player Paolo Rubinato and parent Pansy Wright Simms, he has trained a generation of determined, eager and highly motivated students, who always bring their best game and best attitude to the volleyball court. 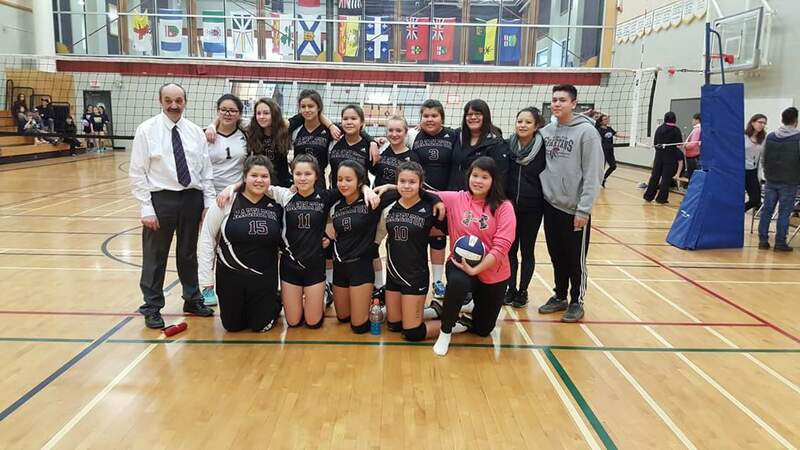 The pay-off for all that hard work came last weekend, when zones in Terrace and at Hazelton Secondary ended in success for both our Grade 8 and Junior Girls. Our grade 8 girls won bronze at their zones in Terrace. Congratulations to Tournament All Star Roche’ Simms and Team All Star Grace Vickers! Our Junior Girls and their coach Mrs. Giguere won their zones after a last compelling and very close game against Ebenezer Christian Reformed School from Smithers. Congratulations to Emma Hobenshield and Jaimie Denny for being awarded respectatively Most Valubale Player and Tournament All Starr awards! The last volleyball zones of the year will be at Hazelton Secondary this weekend! Come out to see some great volleyball and support our our own Spartan Senior Girls!